Today’s ceramic veneers offer a whole host of useful qualities and functions. This blog provides insight from one dentist on how to take advantage of ceramic veneers in your practice. It’s just one more example of how we can be creative in our application of dental materials. We have an immense amount of flexibility today in utilizing ceramic veneers. Many of us think of these as just a thin sheet of ceramic that covers the labial of the tooth and acts as an enamel replacement. This is still a very common use. It can help improve the esthetics for patients where their enamel has been damaged after orthodontics. It can also be used for calcium deposits or decalcification. We can also change the style of our tooth preparation to increase the uses of a veneer. If we break contact on the interproximal, it allows us to change the shape of the tooth. We can make adjustments to the alignment of the teeth to have it appear as if the patient has had some simple ortho. Breaking contact can then be accompanied by placing the margins sub gingival. This now gives us the ability to close the gingival embrasures and eliminate unsightly black triangles. 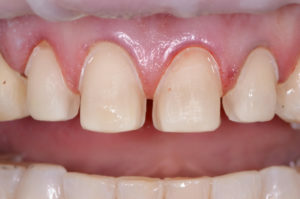 When we use veneers to alter incisal edge position, we can give patients a more youthful appearance as well as change their anterior guidance and improve the function of their teeth. We always think about the obvious advantage of veneers as the ability to change the color of the teeth, but being able to change shape, contour tooth position and function are incredible advantages both esthetically and functionally. How do you keep up with the latest advancements in dental materials and techniques? We’d love to hear from you in the comments!